Let’s talk about bias. I have it. You have it. As humans all of us have our own opinions towards virtually everything that comes across our plates in our daily lives, be it (literally) a menu option or (the more serious) potentially deadly first impression. And researchers, from the molecular biologist to the cultural anthropologist, are not excluded from this inherent trait. However, there’s a perception in society that science is only legitimate when it’s absolutely objective. That is, to conduct purely scientific research is to remove yourself from the thing you’re studying in order to present the results in the most balanced light possible. Otherwise, how do we know for sure that your conclusions aren’t skewed by your internal advocacy or prejudices? Short answer: they are. Here’s why I think it’s a good thing. Where “normal” research consists of blind trials, randomization, multiples tests, and controlled groups, qualitative research often doesn’t afford the luxury of such static, planned environments. Social or cultural anthropologists often conduct work that is qualitative, like ethnographies, whereby we embed ourselves in a culture or location that we study purely through observation. Often our subjects are entire cultures or subcultures, definitely unable to be sorted into Group A and Group B for some statistical test, especially when they’re at-risk populations (like hookers or drug dealers for instance. Seriously!). Our observations are made through the lens of human perception. As such, we see things that are inherently influenced not only by our education, but also by our past experiences, personal opinions, and even our demographic information. Because of this, it can be difficult for the consumer to feel that they’re getting a scientific conclusion. Let’s say I’m studying public space issues when a protest camp springs up in a nearby city park (spoiler: this is a true story). After drawing up my research plan, I receive rushed approval through my university to conduct an ethnography on this at-risk (read: illegal) group. By slowly being accepted into their community through volunteering at the information tent, I’m able to get more information on the social hierarchy, the various subcultures and their structure, and create a comprehensive picture of the camp’s physical layout and development over its month-long occupation. Once concluded, the resulting report is released as a “draft for discussion” for commentary by the larger academic anthropology community. But that’s not quite right. Let’s look at that again more comprehensively. More than observation and analysis, I the researcher come to this topic from a young woman’s perspective. I also happen to be an advocate for many of the issues the protest camp stands for, but as a complex individual I am simultaneously against some of the others. And as could be expected, during my time there I inevitably get to know the people who are passionately protesting their beliefs, becoming emotionally involved and even forming lasting relationships with some of them long after the camp is gone. By slowly being accepted into their community through volunteering at the information tent, I’m able to get more information on the social hierarchy, the various subcultures and their structure, and create a comprehensive picture of the camp’s physical layout and development over it’s month-long occupation. The academic impetus for this research was that by gathering this information I’m hoping to further a larger body of knowledge on subcultures (anarchists, etc. ), the Right to the City in public space (how “public” is your park? ), and provide a first-hand account of a 21st century protest camp (the first of its kind in years!). But as a person, I also want to tell the protesters’ story because of the lack of awareness the public has about these individuals, while simultaneously advocating for the democratic use of public space for things like civil disobedience. Separating activism and analysis can be tricky, and it’s something that I’m constantly trying to keep in check. 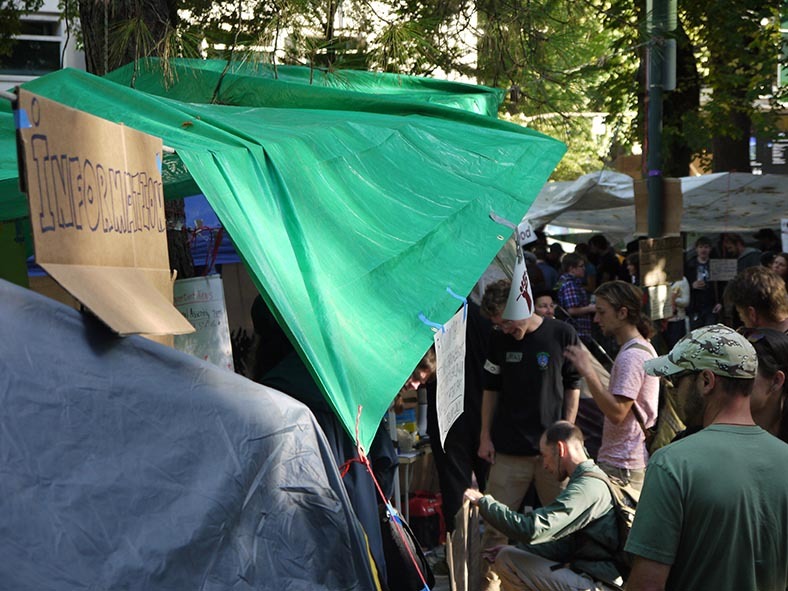 When I strung up tarps in the rain and marched side by side with protesters at Occupy Portland, it was difficult at times to gather data while also being so intimately involved. When I reported my results, it was of course in my voice and limited to my own observations and experiences – as an ethnography often is. Rather than creating a simple statistical report on demographic information of the participants or a historical account of event, I came away with stories because of my close involvement with these individuals. Where onlookers saw a homeless camp, I saw a place full of mostly housed individuals with jobs who were spending every ounce of their free time on this cause. So-called “anarchist punks” were actually skilled organizers, fierce to defend those without a voice and create community where none existed before. And because of my training as an anthropologist, I was able to connect these stories to very serious academic topics of democracy, equity, and our new urban age as humans—something that would be much more difficult to accomplish if I only used quantitative data. But in spite of this, qualitative research is often called a soft science as compared to quantitative research, which is viewed as more “solidly” conclusive hard science. I’ll be the first to admit that this criticism hurts. While not having a microscope in your office shouldn’t make you less of a scientist, you can see where someone could get that idea. The thing is, even the “quants” out there have emotional reasons behind what they’re doing; either some personal incentive or just general enjoyment. Qualitative research just means that you aren’t able to have quantifiable data to compliment your final results—and that’s totally okay. So long as I’m aware of my role as a human-researcher and can separate my emotions from my observations or acknowledge them upfront, my results are as valid as a chemical equation or survey statistic in the quantitative scientific community (there, I said it!). The fact is that we are all human. We make errors regardless of our biases and we allow our passions to drive the work that we do even if only tangentially. We should understand that this bias exists and celebrate it, as much as we would the scientist trying to cure a disease, preserve an endangered habitat, or shed light on women’s issues in the world. This doesn’t mean that we falsify results or make errors based on our opinions—it simply means that we acknowledge and accept the fact that we are all trying to help in the best way that we can, as scientists and as humans, with biases. I am not blind to my bias, but I embrace it. I gather and analyze data on topics that I believe can further my goal of creating better urban environments for people, and I’m not ashamed of it. Science is not and should not be emotionless. There are so many causes in the world today that need attention from researchers everywhere. And since it is personal initiatives that lead people to study these things in the first place—I say, here’s to bias! And here’s to improving lives through (soft) science. This article originally appeared on Peeps Forum. For more on people and culture - for people - check out their site and support their Kickstarter campaign to get them to print!